Action between March 28 and April 3 on bills assigned to the Senate Ways and Means Committee. Action between March 28 and April 3 on bills assigned to the Senate Appropriations Committee. Action between March 28 and April 3 on bills assigned to the Senate Judiciary Committee. Action between March 28 and April 3 on bills assigned to the Senate Commerce Committee. On Friday, we learned that UnitedHealthcare is leaving Iowa’s managed care program. UnitedHealthcare currently is the MCO for over 70 percent of Iowans on Medicaid. 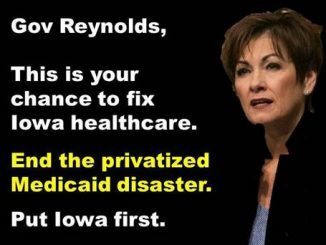 That means 425,000 Iowans will again have their health care disrupted, as they are forced to switch insurance companies. This could put our most vulnerable in life or death situations. Action between March 21 and March 27 on bills assigned to the Senate Appropriations Committee. Action between March 21 and March 27 on bills assigned to the Senate Commerce Committee. Action between March 21 and March 27 on bills assigned to the Senate Education Committee. Action between March 21 and March 27 on bills assigned to the Senate Human Resources Committee.